The Palestinian flag was adopted in 1948 by the Arab High Committee. It is composed of three stripes arranged horizontally (black - white - green) and a red triangle to the hoist*, which points inward. the colours used here are strictly the pan-Arab colors*, as imagined by Mark Sykes, except that the white and green are reversed. The description of these colors is very simple and codified :Black: the Abbasid of Baghdad - White: the Umayyads of Damascus - Green: The Fatimid of Cairo - Red: the Hashemite house of Muhammad. But, like many Arab countries, the colors were directly reinterpreted by the people : black for the Palestinian exodus, white for the courage of the people, green for the land and the natural resources of Palestine, and red for the blood of the martyrs. It should be noted that Palestine is not recognized as a separate state by the international community, even if it is an observer member of the United Nations since 2012. You can download it in different sizes, in a decidedly modern design for your personal use, or for wider use. Palestine's flag is available in 4 different sizes. 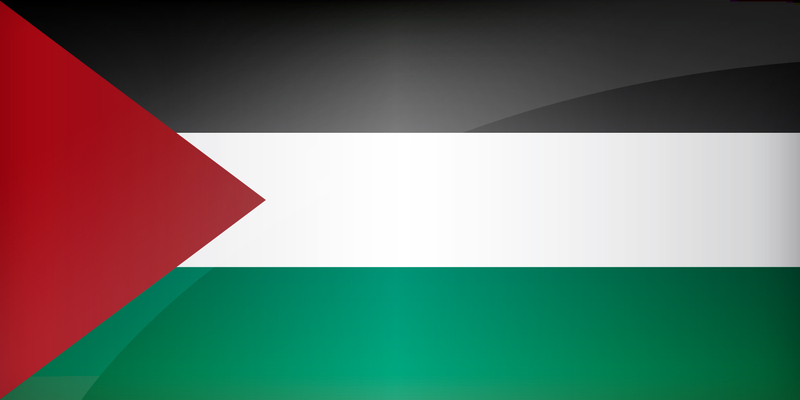 Keywords: Flag palestine wallpaper, Palestinian, Palestinian National Authority, National palestinian flag, banner, pictogram, country, icon, Palestine icon, international, Ramallah / Gaza, Gaza, Jerusalem, Hebron, Asia. This page has been viewed 5094 times.